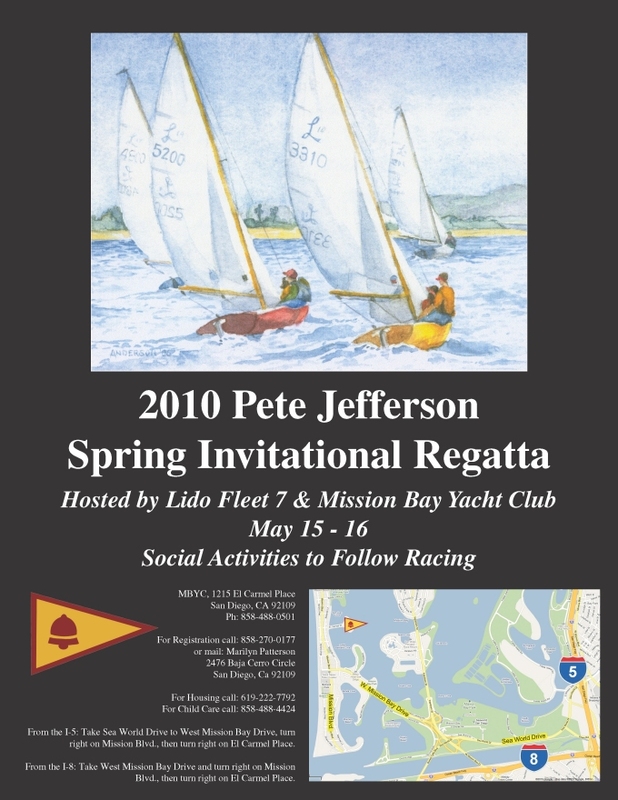 Pete Jefferson, a long standing resident of San Diego, member of Mission Bay Yacht Club, and active racer and supporter of the Lido 14 class represents the ethos of one design sailing and the Lido 14 Class in particular. Pete is charismatic, intelligent, authoritative, a strong supporter of the class, an excellent sailor (demonstrated by winning the 1973 and 1974 Class Championships with his wife Sylvia), and a consummate sportsman. We honor him every year thru this regatta. Pete retired from Lido 14 racing in the mid 1990s. As is occasionally the case, this regatta has gone thru some changes. To those that attended regattas of many years past and this one, the notable difference is that the Snipe class sails too - for their Herb Shear Regatta. This running of the Pete Jefferson Invitational saw eighteen Lido 14s come to the start - 14 A division and 4 B division teams. Stu Robertson and Mandy Smith started out with a first place finish in the first race and from there on never sailed worse than 2nd. Regardless of how dominant his scores look today, going into race number 5 (the second race on Sunday), Bruce Golison and Dina Corsi were only a single boat away (7 vs. 8 points). Though Saturday's racing started out with a very windy (perhaps 15mph) race with winds more northerly than many considered typical for the venue, as the regatta progressed, the winds got lighter - resulting in more shifty conditions that put a premium on being able to "connect the dots" between puffs and shifts. The turning point of the regatta, if there was one, was in Race 5 where Bruce and Dina found themselves pinned out to the left side of the course by veteran Lido 14 racers Freddie and Fred (son and father, respectively) Stevens (from Alamitos Bay YC). Stu and Mandy, in the free to work the right side of the course where they found more favorable conditions leading them to the finish first. Bruce & Dina, not being very familiar with the courses and local knowledge, ultimately dropped to 5th coping (not successfully) with the infamous shifts in the vicinity of the MBYC finishing tower. In addition to racing, there were a number of social events during the regatta. The MBYC junior sailors offered BBQ and the top two boats of each class shared details about their racing with the rest of the sailors. Some notes on the letter scores. This regatta had more "letter" scores (DNC, DNF, RAF, etc.) than is typical. We take a moment to look at some of them as understanding how they came about helps complete the story of this event. Historically, knowing where the marks are located, keeping track of the marks to be rounded has played an important part in succeeding on MBYC's courses. Steve and Kristina Potter's RAF in R4 concerned not sailing around an offset mark (a second mark near the weather mark) in what was an otherwise excellent race for the Potters. Apparently the offset mark was located a bit downwind (which is not customary), making it less obvious that it was part of the course. Our condolences. Bruce and Dina were having a tough time (OCS for the second time in the regatta) in R6 and knew that their position in the regatta was not going to change. At some point they looked at the rather large Snipe fleet getting ready to sail in for the day and decided the smart move was to win the race against the Snipes returning to the hoist. Walter Johnson and Sarah Ryan suffered a broken rudder in R2. A gremlin attacked his hardware back at the Harry Wood Memorial too so we've got our fingers crossed that the gremlin has moved on to some other boat (not in the Lido 14 fleet!) so that Walter can focus on racing. In actuality, the competitor's mainsheet snagged Walter's tiller and slammed the rudder over hard - causing it to split in two. Terry Cannon suffered a mechanical breakdown relating to her centerboard. Mark Ryan (often sailing as team with his sister Sarah) had to go to work on Sunday. Mark Ryan & Hannah ?